Perfect Diet Tracker for Mac is diet software that will help you lose weight by tracking your daily calorific intake, making calorie counting easy! Includes access to a database of over 75,000 food items with no ongoing subscription fees. Both imperial and metric measurements are supported making it easy to add new food and exercise items to the diary worldwide. It has an easy to use, intuitive interface and an extensive international food. ...... software suggest a personal diet plan based on your current situation and the targets you want to achieve or enter your own custom diet plan. The diet tracker puts you in control. Track your diet, adding items you eat or drink to the food diary. With over 80,000 products in the food database, adding items is quick and easy. 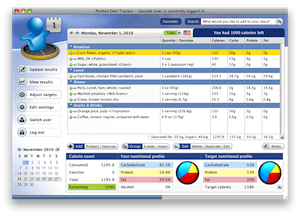 Perfect Diet Tracker for Mac takes care of the calorie counting and exercise tracking for you, monitoring your calorific and nutritional intake. Stay within the targets and you will achieve the weight loss you want. No problem and no extra charge. Each user can set a password so other users cannot see what you are eating, or currently weigh. Calculate your 'basal metabolic rate' or BMR. The Diet Tracker can help you track the progress of your diet or excercise. Perfect Wine - the easy way to organize your wine collection. Perfect Absorber - flight 3D arcade game. Qweas is providing links to Perfect Diet Tracker for Mac 3.5.7 as a courtesy, and makes no representations regarding Perfect Diet Tracker for Mac or any other applications or any information related thereto. Any questions, complaints or claims regarding this application Perfect Diet Tracker for Mac 3.5.7 must be directed to the appropriate software vendor. You may click the publisher link of Perfect Diet Tracker for Mac on the top of this page to get more details about the vendor.